Several South Indian invasions took place during the late Anuradhapura period. As a result, Hinduism gained ground in Sri Lanka. Opening years of Polonnaruwa period started with Chola regime. The Chola regime lasted at Polonnaruwa for more than five decades. Following this Chola period, 157 years of Buddhist rule existed. After the Buddhist rule two decades of Kalinga, Magha period existed. Cholas administered Sri Lanka as a province of Chola empire, under the name of Mummudi-Chola -Mandalam. Mummudi-Chola was a well-known title of Chola king Rajaraja I. Opening years of Polonnaruwa period in Sri Lankan history started with Chola regime. The recoveries of Chola inscriptions from Mantai have provided some important clues and valuable information about the expansion of the Chola Kingdom from South India to ancient Sri Lanka. It seems that often Cholas sent their officials to the occupied areas in ancient Sri Lanka to coordinate the administration. The Chola areas of ancient Sri Lanka were referred to as “Mummudi Chola Mandalam”. The Chola invaders had built typical Hindu temples according to the Dravidian architecture. During the Polonnaruwa period, the Chola regime or dynasty was dominating in South India. Yet it is worthy to mention here that Polonnaruwa period architectural structure had certain unique and exclusive patterns. Majority of the Hindu temples were built only during the Polonnaruwa period. Numerous Hindu bronze statues were installed in the Hindu temples in the Polonnaruwa period. The bronze statues of the period were considered as some of the best sculptural creations in the world. During the Chola occupation of ancient Sri Lanka, they influenced the Sri Lankan art, culture and religion. During their occupation, they built numerous Hindu temples at Mathota, Polonnaruwa and several other areas of the island. According to historical evidence, Cholas made a lot of endowments to the Buddhist monasteries. Discoveries of many engraved early historic stone inscriptions were found at various locations of Polonnaruwa. The great extent of South Indian Hindu influence started in Sri Lanka especially during the opening years of the Polonnaruwa period. During the Polonnaruwa period, numerous Hindu temples were built in and around the capital city of Polonnaruwa and its vicinity. The Hindu culture, its dominance and the traces of Hinduism introduced during the Chola period could still be found in numerous existing forms, especially in the form of stone inscriptions, Hindu icons (including bronze and stone sculptures), decorative dance sculptures, general sculptural dance poses and Hindu Dravidian architectural structures. All these provide meaningful evidence to the masses to gather information about the Hindu cultural influence during the Polonnaruwa period. The Chola style structure and building decorations of Polonnaruwa resembled the typical South Indian influences. Despite, such architectural styles, structure and building decorations had certain close affinities and links with the earlier Buddhist rule. It reveals the admixture of Buddhist and Hindu architectural structures, style and patterns. 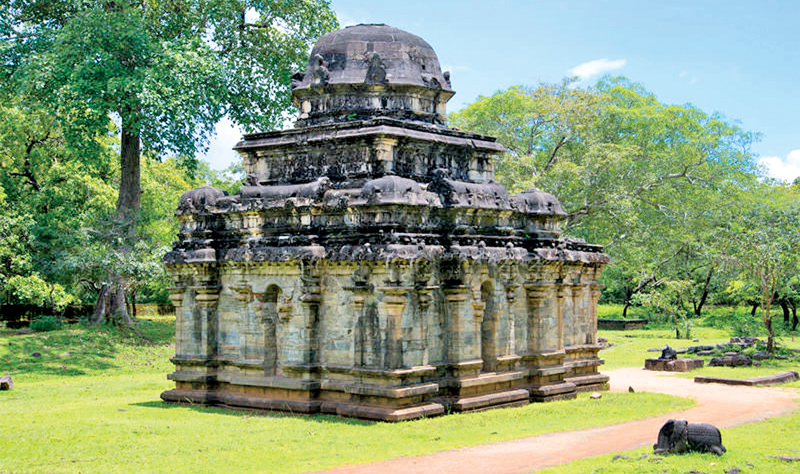 Chola administration in Polonnaruwa was marked with a Hindu revival and construction of several Siva and Visnu Kovils (shrines), with Chola architecture and tradition. To signal the conquest of Sri Lanka, under the instructions of King Rajaraja, officers constructed a stone temple of Siva in Polonnaruwa and another at Mathottam. According to Chola inscriptions, many Hindu temples dedicated to Siva and Visnu were erected in and around Polonnaruwa. From these temples, many forms of images of Saiva and Vaisnava have been recovered. It can be said that there was a co-existence of twin worship of Lord Śiva and Sri Maha Visnu worship prevailed during the Chola dynasty in Sri Lanka. The Visnu statues are generally divided into three different categories based on their appearance. They include standing, sitting and sleeping (reposing position) which is popularly known as “Ananda Sayanam” in Sanskrit. The ancient Maha Visnu statues found in Sri Lankan Polonnaruwa archaeological sites are depicted in standing positions only.